Dagenham Park Church of England School is an 8 form of entry mixed secondary school characterised by its commitment to inclusion and its highly successful performing arts specialist schools programme which has a tangible impact on the ethos of the school and has led to a number of nationally recognised achievements. The school’s student body is diverse in terms of ability and ethnicity, with a large proportion having English as an additional language. The Building Schools for the Future (BSF) programme for Dagenham Park School includes a change of governance to voluntary controlled, Church of England, status. This will increase parental choice within the borough and create a ‘throughout’ campus with the nearby William Ford Junior School and village infants schools. This transformation will lead to improved transitional arrangements, increased opportunities for collaboration and sharing of specialist facilities. Crucially the BSF investment will build on Dagenham Park School’s strong reputation in the performing arts, establishing the school as a centre of excellence and a key provider in the Borough’s plans for the 2013 entitlement. The school has a number of partnerships with local and national performing arts bodies. Although the new building is very simple in form, the project has been a pioneering example of collaborative working between the construction and design team. The building was designed to maximise the use of off-site fabrication through the use of an integrated facade and structural system as well as other key components such as building services modules. This system, for which this project serves as an exemplar, provides a number of significant benefits to the process including an 8 month reduction in construction time. The project was very much a coming together of a number of organisations to deliver the project on time and on budget. The project was led by Laing O’Rourke Construction South who managed both the Building Schools for the Future Bid, as well as the Design and Construction process, with Allford Hall Monaghan Morris leading the Design Team. Both organisations forged a strong relationship with the School Leadership Team, as well as the London Borough of Barking and Dagenham, (LBBD) to ensure that the new building met with the client’s brief. This relationship has been further strengthened through work experience placements offered to students of the school, plus the employment of local contracting firms. As testament to the strength of collaboration on the project the Local Education Partnership formed between Laing O’Rourke and LBBD, the Thames Partnership for Learning (TPfL) will continue as a method of delivering other much needed projects, such as housing, within the Borough despite the cessation of the BSF programme. The building was procured as a Private Finance Initiative with Laing O’Rourke also fulfilling an ongoing role as facilities man¬ager for the site. This ongoing role meant that life cycle con-siderations were a key criteria in selecting the building systems. The design and procurement programme for the project was very compressed with completion of the new building targeted within 28 months of the start of the bidding process. The first 12months of this programme encompassed the design phase including a full planning application leading to financial close. The use of off-site fabrication involved the use of an integrated facade and structural system as well as other key components such as building services modules. The structural and facade design was carried out with early input and involvement from the manufacturing specialists and used Building Information Modelling to generate and extract geometry for the purpose of manufacture. The multilayerd facade panels each measuring 7.5m x 3.6m form a loadbearing external and arrive on site with the windows already installed. 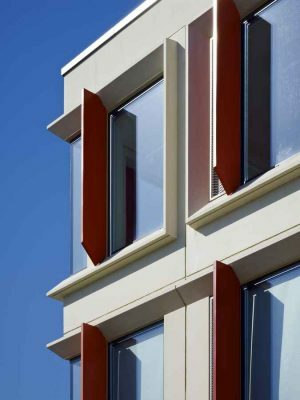 The facade panels form one element with an integrate structural solution that also includes precast concrete columns, walls and soffit panels. The soffit panels act as permanent formwork for the in-situ concrete slab. The building components are fabricated in controlled manufacturing conditions to maximise quality (including air tightness) and minimise waste and working at height. Operating at maximum capacity the Laing O’Rourke Precast Concrete Manufacturing Facility could create all the precast concrete components for Dagenham Park school in 2-3 weeks. The manufactured components were ready for delivery on site as soon as the enabling and ground works were complete with the structure and facade erected within six months of site operations commencing allowing for early starts on the fit out packages. The construction phase of the new building was only 16 months which was made possible through the implementation of Laing O’Rourke’s strategy of ‘Design for Manufacture and Assembly.’ A comparable project of this size, delivered without the use of this strategy, would have taken 22 months construction phase. Safety was of paramount importance particularly as the building was constructed on a ‘live’ school campus – how to achieve this was a key driver in the early design process when the phasing strategy for the scheme was developed. The building achieved completion over 250,000 working hours with no reportable or lost time incidents.